1. “Sri Rama Jaya Rama” Mantra was chanted during Deepa Pooja, Shivalinga Pooja and daily by our Balwadi school children, cultural class students and during monthly meetings by our Balwadi teachers and Social Workers. Every month nearly 7, 72,361 times mantras were chanted in 84 localities. 2. Through 74 Balwadis, 2,007 rural Children were nurtured. In all the Balwadis, Malt along with hygienically prepared highly nutritive lunch with vegetables was served during the day. And in the evening vitamin-rich cereals were provided to the children. 3. In our Medicare Programme, 1895 patients were examined and treated for various common ailments, through 14 Rural Medical Centers in Kanyakumari, Nellai and Thoothukudi districts. 4. Eye camps were conducted at 2 places, in Kanyakumari, and Nellai districts in which 577 were treated for their eye ailments and 153 were operated for cataract.21 persons given eye drops and 21 persons given spectacles. 5. In 191 Samskara Vargas, 7320 students participated. The students were taught about the values of Indian Culture, through games, lectures & lessons. The feelings of oneness were strengthened among participants, through patriotic songs and games. 6. Under Adopt a Grannie Programme, 30 destitute and old people were provided with monthly solatiums, in the form of rice, dhal, oil, etc., for their livelihood and 112 persons provided rice only, in Southern four districts of Tamilnadu. 7. Monthly Deepa poojas were organized in 214 village temples in five districts of Southern Tamilnadu, in which 9452 ladies participated and offered prayers for the welfare of self, family and the society. 8. Under Amrita Surabhi Scheme, our Kendra workers collected 1227 Kgs of rice from five districts. 10. Vivekavani Subscriptions for 114 for one year, subscriptions were collected. Mananeeya Eknathji Janma Sathi Parvan through special campaign 165 ADP, 56 LDP and 5 PP Patrons collected. 15. Shivalinga Poojas were conducted at 03 places in Kanyakumari District and 236 members participated. 16. Durga Pooja was conducted at 03 places, in Kanyakumari District in which 231 devotees participated. 17. Anna Pooja was performed at Ramnad district and 650 devotees participated in the function and 58065 kgs rice collected. 18. Vacs College Boys Camp conducted at Kanyakumari from 05.03.2015 to 08.03.2015. 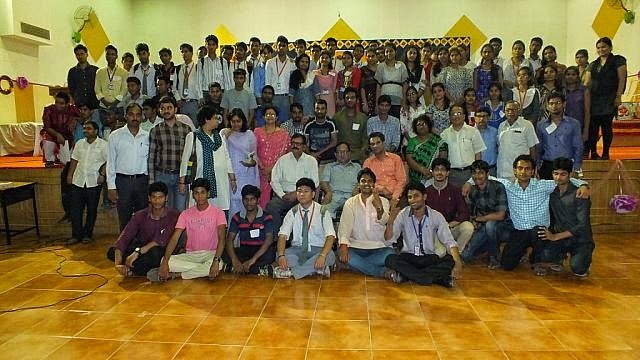 187 students from 32 Colleges and 2 Parents participated in this camp. 19. 1008 Deepa Pooja was conducted in Vallioor ( Nellai District) Sri Subramania Swami Temple and Ottapidaram ( Thoothukudi District) Sri Viswanathasamy Temple where 1715 devotees participated from 72 villages. 20. Swami Vivekanandar Jeyanthi Vizha was performed at 18 places in 4 district and 7550 devotees participated. In Vivekanandapuram Kanyakumari, during the times of Vinayagar Chathurthi and Sri. Eknathji’s memorial day, for the purchase of vegetables we went to the market at Vallioor. We were able to purchase all types of vegetables. But it was very difficult to purchase a kind of small size banana. We were searching and in one shop only one bunch of banana was available. We asked the price of the bunch of banana and he said for Rs.400/-. We bargained for Rs.350/- and told him it is for Vivekananda Kendra. Immediately he gave it with free of cost without any money as donation to Vivekananda Kendra. The effect of the word Vivekananda Kendra has impressed him very much which made me to wonder. Our Vivekananda Kendra Balwadi at Adaichani is functioning for the past 28 years. All the students who studied in our balwadi are working in various fields having good characteristic qualifications, one such student is Mr.P.Lakshmanan who studied very well and will participate in cultural class competitions and getting prizes. Later on he has completed. B.E., and now working in Indian Overseas Bank, Tiruchendur. When I approached him to participate in the cultural class competitions and he gave Rs.1000/- as donation for the prizes to be distributed and also assured me that in future also he will help for each and every function. I wondered that the student who studied in our balwadi has become to a good position and helping for the balwadi. In Ramnad book exhibition was conducted and 170 shops were there. So many people all school students visited the exhibition. The District collector used to visit in alternative days to the exhibition and will not forget to come to our book stall and enquire about the sales. All other owners, of the shops came to us and asked the reason for the visit of the District collector to our book stall. This made me to feel so proud about our Vivekananda Kendra. "एक सेनापति की तरह अपना लक्ष्य निश्चित करो और शक्त्ति, सामर्थ्य की सीमाओं पर विचार करते हुएं उसकी प्राप्ति के लिये रणनीति बनाएं तथा सर्वश्रेष्ठ मार्ग का चयन करो। तभी और तभी केवल श्रेष्ठ उपलब्धि प्राप्त हो सकती है।"
The website has been started on Rashtra Chintan Diwas, a First day of Samartha Bharat Parva, and till now 1,288,294Suryanamskars have been registered. 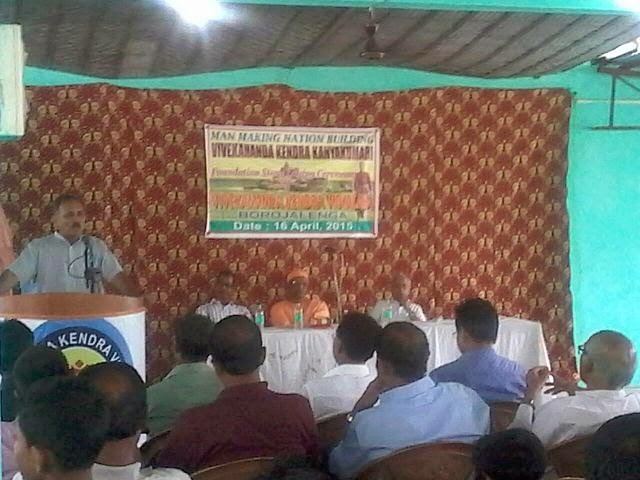 Yuva Samelan was organized on 12 april at Guru Ghasidas Central university. In Yuva Samelan chief guest as Prof. S. P. Singh (VC of GGV) was present along with Shri Ullas Wareji (Nagar Pramukh of Bilashpur), Prof S. N. Choubeyji (Rajistar of GGV), Prof S.V.S. Chauhan (DSW of GGV). Games, lecture, group discussion, songs were the part of the samelan. Main aim of the samelan is organized the youth for the service of society. Yoga is core of vivekananda kendra. Yoga is way of life. 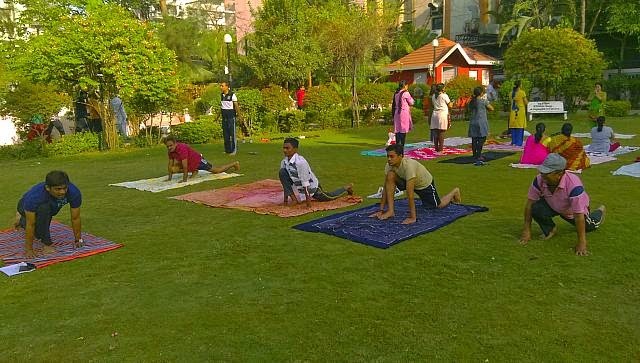 As part of this Vivekananda Kendra organizing Yoga Varga and Yoga Satra at various places.Two Yoga Satra has been organized from the 1st April to 5th april 2015 at Agrasen Garden, Citilight in which 17 participants have actively participated. And another Yoga Satra has been conducted at China Gate-3 Soc., New Citilight ,Surat From 7th April to 11th April and in this 6 participant has actively participated. At present one yoga Varga has been started at Agrasen garden, Cililight,Surat. Vibhag KPS of Barak Velly, Assam - 17 apr to 19 apr 2015. Sthanik KPS of Dibrugadh, Assam. Kendra Varga is started of Dibrugardh on every sunday. On 16th april 2015, bhumi pooja and foundation stone laid of school building of vkv borojalenga, silchar, assam. Pujya swami Satyasthanandaji Maharaj of Ramkrishan Mission silchar blessed on this occasion.